The Enso Epic Flat Iron Infrared is our epic ceramic tourmaline hair straightening iron that is a step ahead and will allow you to push the boundaries of your game. Ceramic has become a 'buzz" word, but the reality is that all ceramic are not created equal. Far from it. 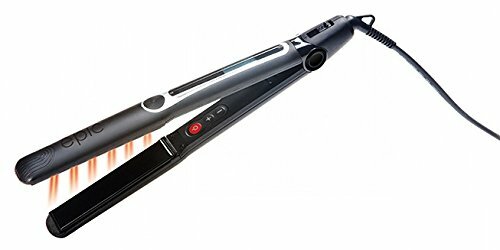 We have harnessed the best of the best of ceramic: the superior quality of black Nano ceramic for the plates combined with the ceramic tourmaline technology and are now the only ones to be able to offer the first flat iron that can style at a temperature of 450 F degrees, for a perfect Keratin straightening without the static and frizz. Automatic shut off. Dual Voltage. BLACK NANO CERAMIC PLATES with genuine crushed Pearl provides a smooth, durable surface ideal for Keratin straightening. TOURMALINE TECHNOLOGY provides maximum negative ionic output to lock in moisture and eliminate static and frizz. LED DIODES produce infrared rays to help heal and repair damaged hair. ENERGY SAVINGS TECHNOLOGY (EST) prolongs heater life and saves energy. UTO SHUT-OFF safety feature after 60 minutes of non use. WORLD VOLT technology allows styling tool to be used anywhere in the world with an adapter and maintain its power.